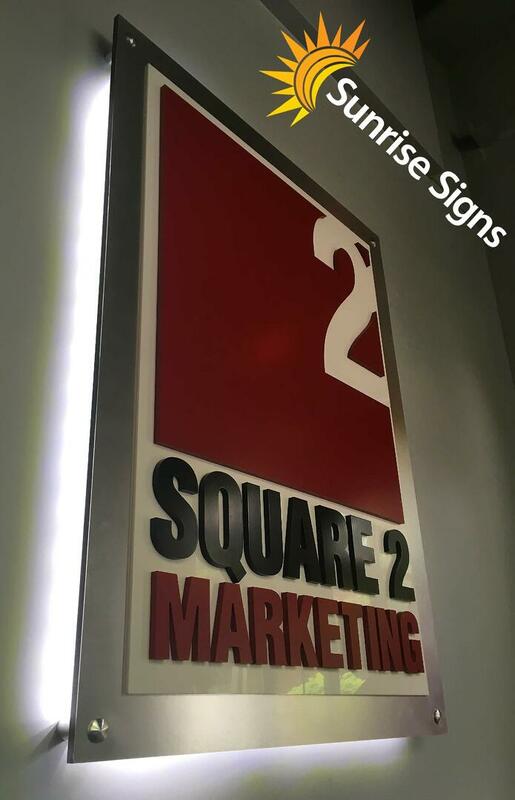 Square 2 Marketing is a digital inbound marketing agency based in Conshohocken, PA. Founded in 2003, they operate around simple principle: give clients the advice they truly need. Since that starting point, they’ve been adapting marketing strategies and deliverables to match the evolving needs of today’s digital customers. Always on the forefront of inbound marketing innovation, Square 2 Marketing expanded their expertise into sales enablement, marketing technology implementation and demand generation. From their status as HubSpot’s first-ever Diamond-level agency partner to recently being named one of the top content marketing agencies in the U.S. by UpCity, Square 2 has built their reputation on a history of helping clients increase their revenue and expand their business. Square 2 is always looking to the future, identifying emerging tactics and strategies that contribute directly to their client's bottom-line growth. Square 2 Marketing was relocating to a new office space and wanted to incorporate some eye-catching and dynamic interior branding to their blank office space. The project area we worked in was the main entrance and hallway to Square 2’s office. They knew the importance of making a strong impression of their corporate corporate to both their employees and clients. The team here at Sunrise Signs was more than happy to bring that vision to life! 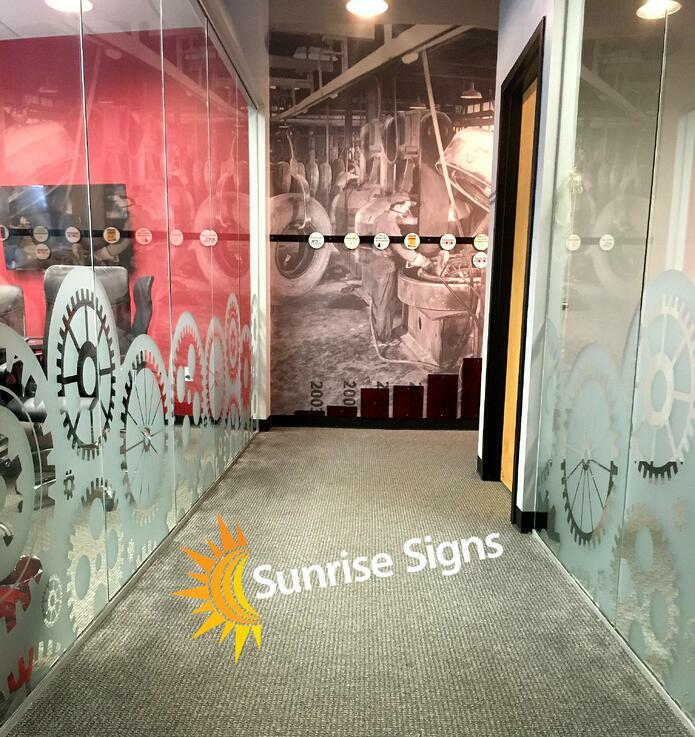 The project consisted of several elements: front door vinyl graphics, an illuminated stand-off lobby sign, etched glass privacy graphics, and a multi-piece wall timeline wall mural. Without further ado, let’s check out the project! 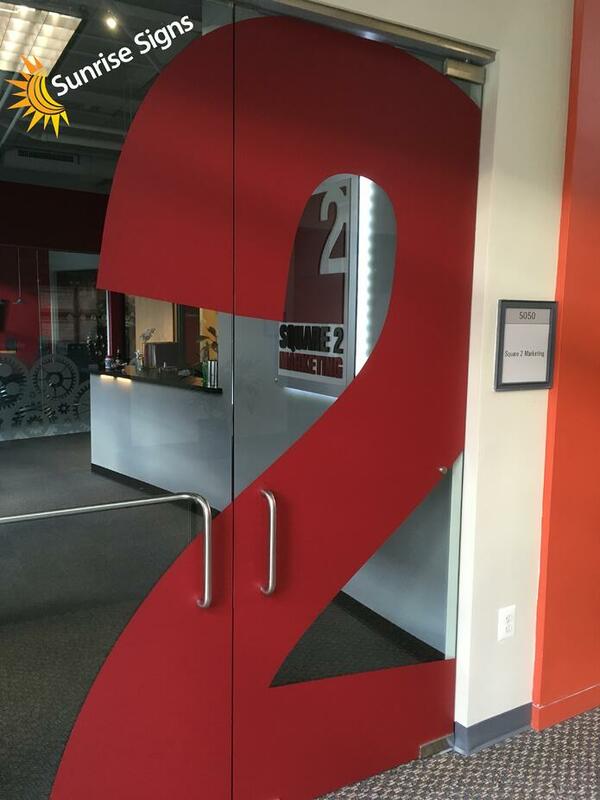 For this piece we fabricated a large vinyl “2” in the same font and brand colors found in the Square 2 logo. They wanted the installation on an angle to embody the unique approach bring to digital marketing. ...you're not going to miss this entrace! This glowing stand-off sign really stands out with it’s multiple elements and pieces. For this sign, we started with an aluminum backing panel, with ½” stand-offs to project it from the wall. Mounted to the backing panel was a white acrylic panel, on which routed dimensional letters were attached. For the “square” in Square two, we reverse cut a PVC sintra substrate to give it some depth. The company name was produced from the same material, and everything was color matched to fit within Square 2’s branding guidelines. The part of this job that really "shines" is the LED lighting we installed behind the backing panel. This added a nice, bright white glow behind the sign and makes it pop off the wall! Another element of Square 2’s office branding came in the form of some cut etched window vinyl. This material give the appearance of acid etching glass, but in a more cost effective and convenient way. Since it’s an adhesive backed material, the integrity of the glass isn’t affected and it can be removed later if needed. 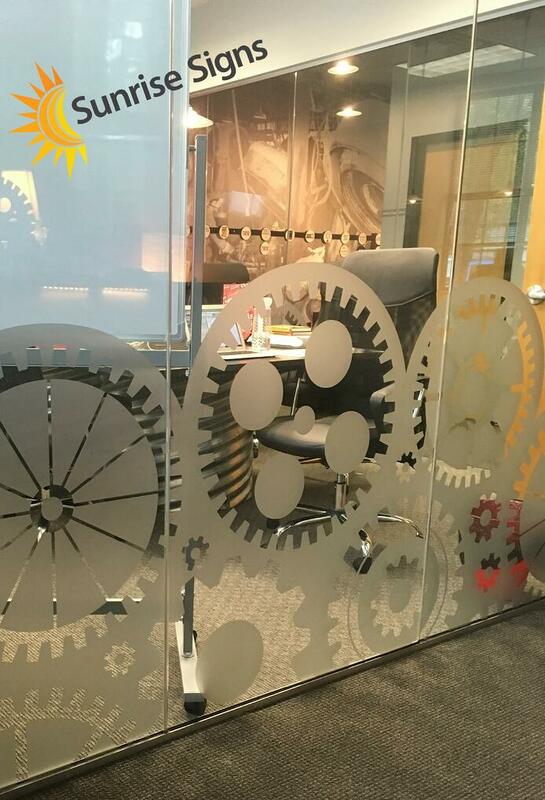 To show that their “gears are always turning”, we cut a gear pattern to cover the flanking walls of two of their conference rooms. This hallway is the only way to get to their main office - so there’s no missing these sharp graphics! ...you can't miss the personality in this hallway! 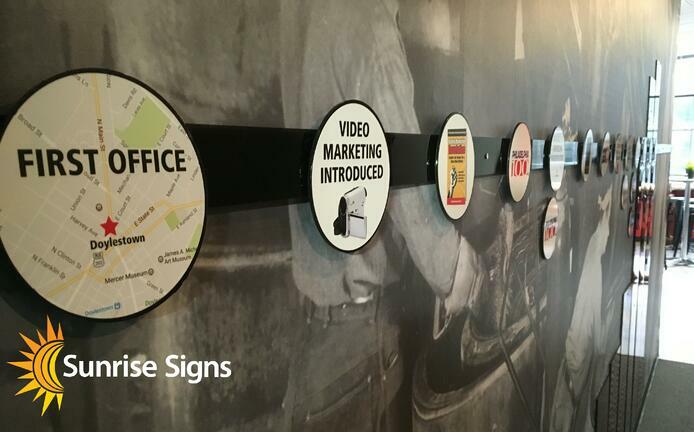 The centerpiece of Square 2’s corporate culture branding is without question their history timeline mural. The background was produced on a digitally printed wall film and shows an old factory scene that was actually taken in the building Square occupies. 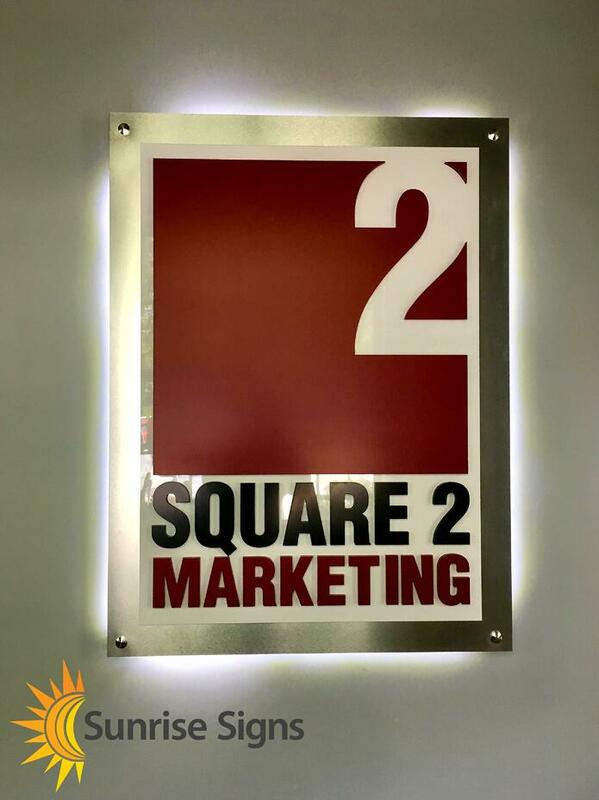 The history of the building is then built upon by the history of Square 2 Marketing. Square 2 wanted to show a timeline of their growth and highlight the milestones they reached along the way. 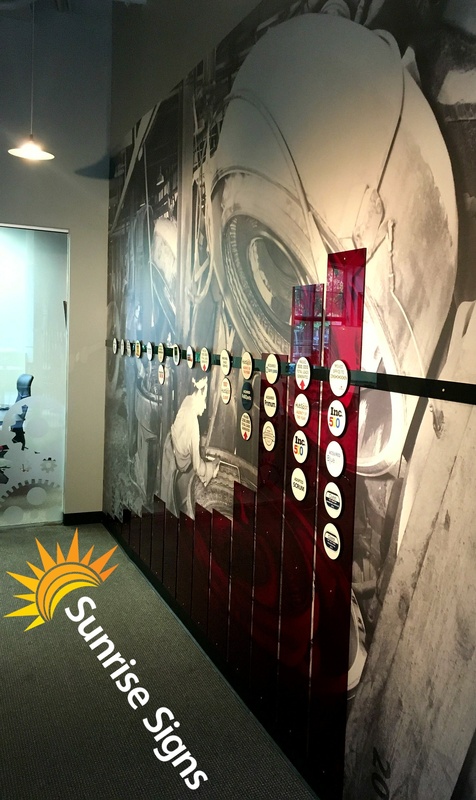 To do this, we ran an acrylic bar across the center of the mural and cut acrylic circles overlaid with vinyl to highlight their achievements. 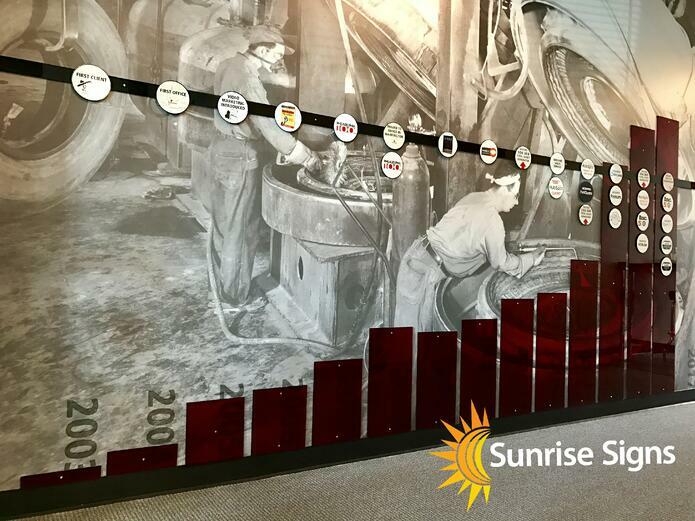 Along the bottom of the mural, we use a translucent red acrylic to plot their growth over the years. As you proceed down the wall, the evidence of their success becomes more and more apparent! We built in room at the end of the mural to add additional updates as Square 2 continues to grow! The last piece of the project was small but fun one! Square 2 has dedicated rooms for the use of cell phones or private calls. Rather than having a plain old placard or no label at all, they decided to have a little fun with the space - and we were all too happy to accommodate! 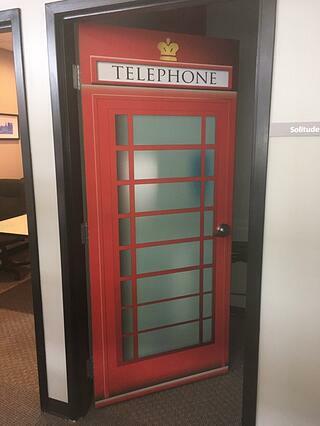 A digital print applied directly to the door did the job for this fun piece of company culture. And that's that! This was great creative corporate culture project for us to work on. Anytime we can breathe some life into an office space we know we've done a good job! Using office branding to improve the image of the company and happiness of the employees is what we're all about! Ready to add a little corporate culture to your office space? Want to show your employees a little appreciation? Give us a call today and we'll get your office branded right!